Our unrivalled SRAM Rival 22 bike offers include three tried and tested road bikes that cater for all riders and riding styles. Each bike is fully loaded with the best and latest parts from SRAM's class leading Rival 22 groupset and here they go head to head with our legendary Ultegra 8600 Pro Carbon. The Ultegra 6800 Pro Carbon has historically been our best selling bike; we've literally sold thousands of them to cyclists from all over the UK and Europe. 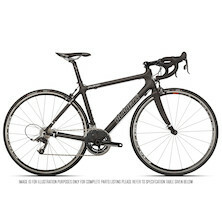 It became the industry benchmark in terms of performance and value for money and was reviewed favourably in the cycling media and won mainstream press accolades. We think we've eclipsed the value and performance of that benchmark bike with our new selection of SRAM Rival 22 equipped bikes. SRAM and Shimano have been locked in a battle to decide who's the top component manufacturer for many years now. Each brand trading punches with the other as they strive to develop and introduce the cycling innovations that will define the future shape of cycling. Each brand has its staunch fans and strong detractors- which groupset and which frame might be right for you? Well read on and find out what they have to offer. This is a real bank busting build with a Toray T800 carbon fibre frame and fork design to cheat the wind and help you sprint for the line to beat the competition. The Nanolight frame is shaped with only two thoughts in mind, maximum power transfer and minimum drag. The Nanolight tube shapes are carefully sculpted to reduce frontal area and parasitic drag while maximizing your ability to drive the bike forward with every pedal stroke. SRAM Rival 22 offers an exceptionally light touch on the shifters. SRAM's Double Tap technology ensures that the brake lever remains just that- a brake lever, simplifying bike control and allowing you make clear and precise shifts even when braking mid corner. Shimano's STI doesn't allow to shift and brake at the same time and the brake lever moves sideways to provide the gear shift, complicating braking choice under pressure. If it just came down to weight then Rival 22 would also be a clear winner. The Rival 22 package weighs less than the Ultegra 11 speed groupset and provides you with a carbon fibre crankset into the bargain, while Shimano still only offer an alloy chainset at the price point. For us if it came down to weight, ergonomics and shifting performance then Rival 22 is the clear winner every time. The Rival 22 Nanolight build look ready to set the world alight with its outstanding mix of performance and unrivalled value for money for the competitive cyclist; at £999.99 it's simply unbeatable. Not every rider needs or wants a carbon fibre frame and for those riders we make the alloy RT-58. Sharing geometry with our carbon RT-58 the alloy version sports a frame shape and tubing design that focuses on providing practical mile-eating comfort for all cyclists. The combination of lightweight, oversized alloy frame and SRAM's Rival 22 gives the perfect platform for your cycling progression. We are confident that this incarnation of our RT-58 is set to become our most popular yet. It might not offer the all-out performance of the Pro Carbon, the versatility of our proven compact geometry frameset, but our customers tell us it is the perfect first step upon the cycling ladder. At £699.99 for an 11sp groupset it also offers value for money that can't be matched. We believe that our SRAM Rival 22 Pro Carbon is the best Pro Carbon we've ever offered. Rival 22 outperforms every groupset we've tried at the price point. The current Rival 22 outperforms previous incarnations of both SRAM and Shimano's range topping groupsets and runs the current Force 22 groupset incredibly close. The Rival 22 Pro Carbon weighs in almost a full half pound lighter than the Ultegra build and uses exactly the same finishing kit so all weight savings come from the groupset parts. SRAM's ace in the hole against Ultegra is its Wifli rear cassette that provides a 'Climber' gear ratio with a 32 tooth maximum cog size. This gives you a gear with an extra four teeth against the 28t limit on Ultegra, effectively giving you an extra gear and a half when the road begins to point upwards. if you are tackling the steepest possible road climbs on a regular basis then it's game set and match for SRAM. Many of our staff and customers have been long time Shimano users but once you've ridden an Ultegra bike and the same bike equipped with Rival 22 over a period of time the differences become obvious. When you look at the performance and usability on offer by both groupsets and then factor in that we are currently offering the Rival 22 Pro Carbon for £50 less than the already discounted Ultegra Pro Carbon we know where our money would go. At £849.99 the Rival 22 Pro Carbon is simply unrivalled. it's the biggest bargain in cycling at the minute and we won't be able to hold these prices forever. If you want to try the cutting edge of frame design and need a powerful, aero profiled frameset it's time to throw a leg over the Nanolight Rival 22. If you want a comfortable, practical mile eater at a sensible price then try out the alloy RT-58 Rival 22 bike; it won't be around at this price for long. If you've been looking at the Pro Carbon, weighing up the options against offerings from other brands then we must suggest that you give the Rival 22 Pro Carbon the consideration it deserves. Even better why not come into one of our shops and try one out in person.